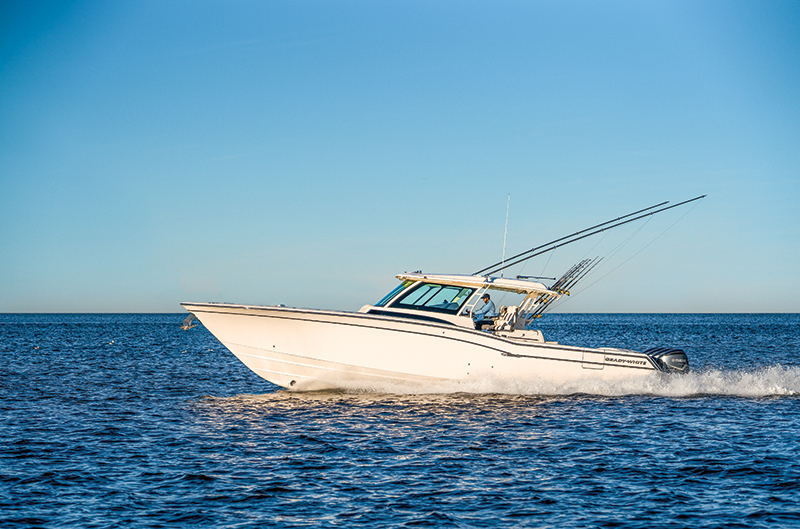 Catching fish isn't this 45-footer's only mission. Grady-White took a deep dive into the big center console game with its latest boat, the Canyon 456, which is its new flagship. 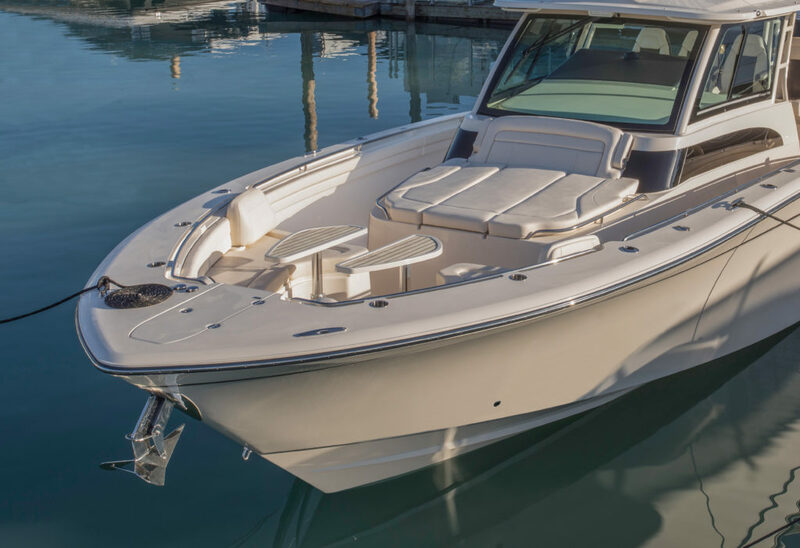 When we saw it at the Miami International Boat Show, it was always full of people, probably owing to its size, obvious fishing amenities and bow seating area that points to its versatility. 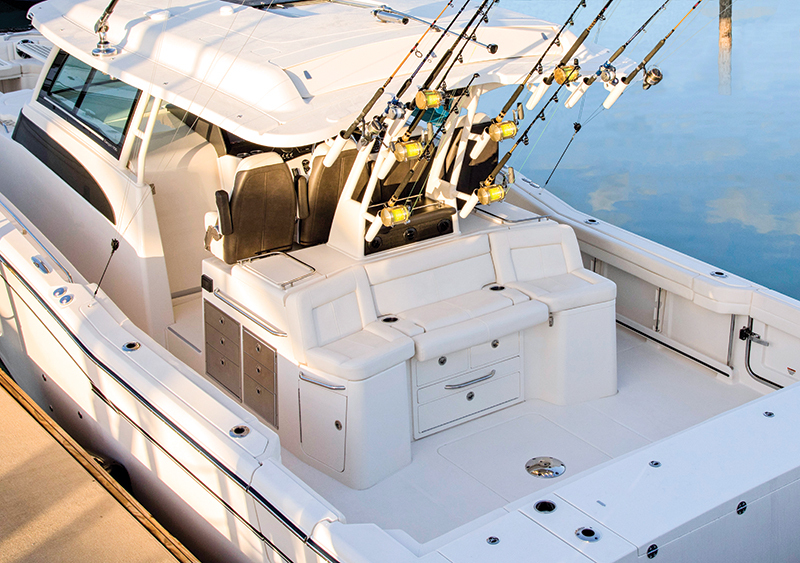 At 45 feet long, the Canyon 456 is a big center console, which is why four Yamaha F350 V-8 four strokes hang from the transom. In initial Grady-White tests, the boat exceeded 55 mph, so it can scoot from fishing spot to fishing spot. And it is outfitted with the fishing features to excel. In the cockpit are twin 35-gallon livewells; a 115-gallon insulated fishbox; a fishing station with seating for three, tackle storage, a sink, a grill and a refrigerator; and a freshwater shower. Ten rod holders are mounted to the hardtop and the support posts, and more are in the gunwales. Three more in-deck insulated fishboxes are in the bow. 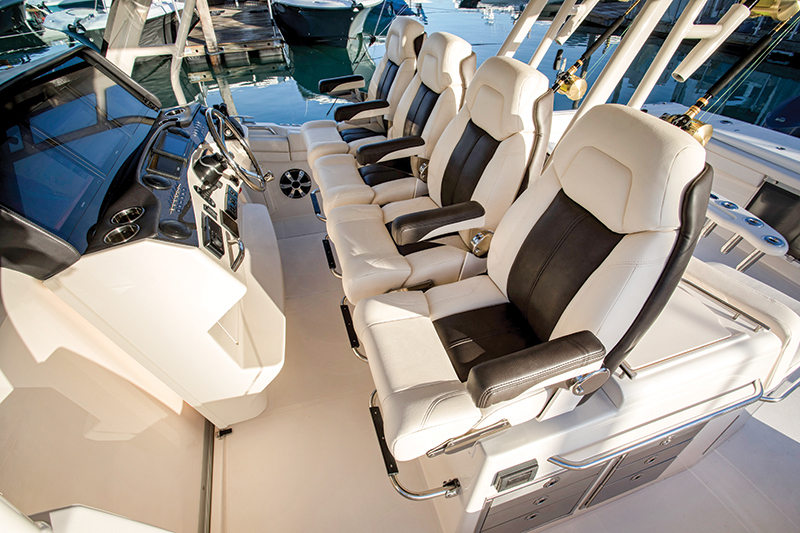 The helm is protected by wraparound glass that’s integrated with the T-top, and three captain’s chairs face a fully outfitted dash with three flush MFDs, throttles, a joystick and everything else — except systems switches, as this is a digital-switching boat. The bow features semi-circular seating tucked forward, with a split table that provides access to the front of the settee. A two- or three-person sun lounge is aft of the seating. It’s definitely a social space, but in-gunwale rod holders and coaming pads that come all the way forward remind loungers that the boat has a business side. Built into the center console is a cabin, and not just an oh-let’s-cram-a-sleeper-anda- toilet-in-here cabin. 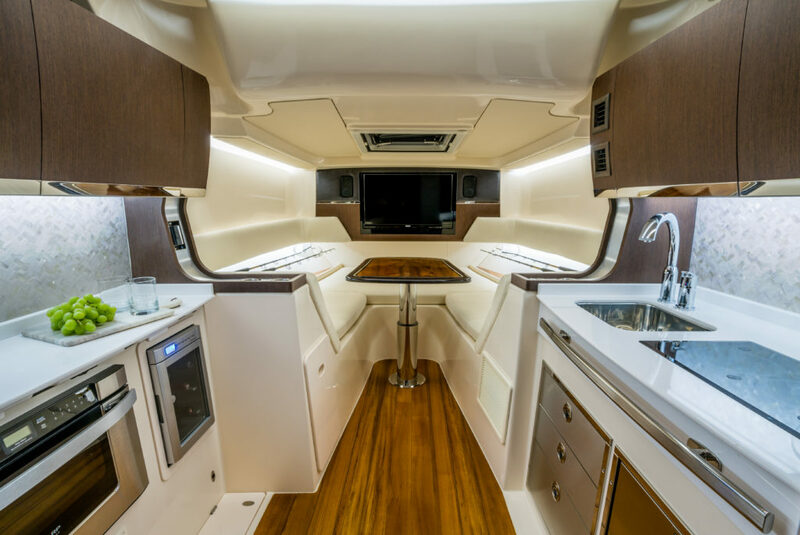 The air-conditioned space includes a galley that is split between port and starboard counters, with a sink, a cooktop and a drawer refrigerator to starboard, and a microwave and a six-bottle wine cooler to port. Cabinets are overhead. A U-shaped settee and table are forward; the high-low table drops to help form a berth. The head is aft and includes a shower, a sink and a VacuFlush toilet. Rod storage is abundant, both horizontally and vertically. Anglers who spend a lot of time drift fishing or who have family members who get seasick will appreciate the available Seakeeper gyro stabilizer. This entry was posted in Snapshot, New Boats and tagged center-console, fishing boat, grady-white, sportfisher, bowrider, quad outboards by Stephanie Shibata. Bookmark the permalink.